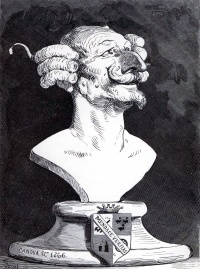 Gustave Doré's caricature of Münchhausen  from Aventures du Baron de Münchausen. The socle of the bust bears the words "Mendace veritas," Latin for "in falsehood, truth." 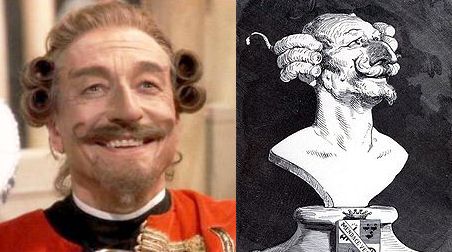 It served as an inspiration to John Neville in Terry Gilliam's film The Adventures of Baron Munchausen. Unless indicated otherwise, the text in this article is either based on Wikipedia article "Doré's caricature of Münchhausen" or another language Wikipedia page thereof used under the terms of the GNU Free Documentation License; or on original research by Jahsonic and friends. See Art and Popular Culture's copyright notice. This page was last modified 11:26, 14 January 2014.